This column is part of the MDG 500 milestone event commemorating the 500 days that remain before the expiration of the Millennium Development Goals. Today, fewer people go hungry. There are more children attending school. Fewer and fewer people are dying unnecessarily from easily preventable and treatable diseases. Yet with only 500 days until the end of the Millennium Development Goals, or MDGs, criticism remains that many countries will be unable to reach what can be considered arbitrary global targets. At the beginning of the new millennium, the world decided to make tackling global poverty a top priority. The MDGs attempted to address this through a set of eight specific goals and 21 targets. The framework focuses on economic poverty, communicable diseases, gender equality, education, environmental issues, and global partnerships. In an unprecedented manner, developed nations rose to the challenge of addressing the key issues facing humanity by instituting innovative programs and significantly increasing funding. While valid criticisms surround the current MDGs, their success in reducing poverty is difficult to ignore. It is thus worth reflecting on some of the countries that have not achieved overall MDG success but have nonetheless managed to improve the lives of millions of their citizens despite large challenges. This column takes a look at the great progress nations have made toward four specific MDGs. Out of all the countries not “on target” to achieve this goal, Bangladesh has made some of the most significant progress. Bangladesh is one of the most densely populated countries in the world and has a rapidly growing population. Nevertheless, from 1990 to 2010, when accounting for population growth, approximately 10.5 million Bangladeshis advanced above the $1.25 per day threshold. * Another 12 million moved above the national poverty line—approximately 8 percent of Bangladesh’s current population. Compared with China, which has reduced its number of extreme poor by 81 percent—meaning that an additional half a billion people now live on more than $1.25 per day—Bangladesh’s number may seem insignificant. But it’s important to remember that over the past two decades, China has experienced 77.8 percent growth in gross domestic product, or GDP, per capita. 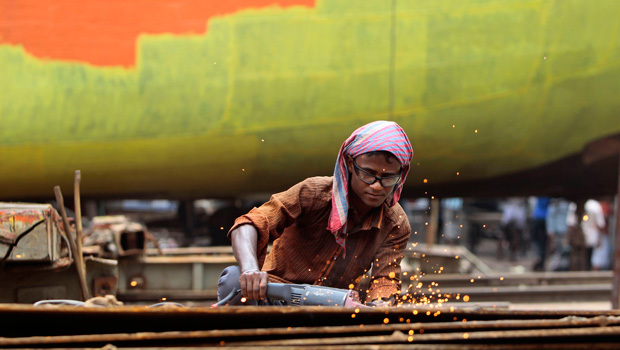 Since 1990, Bangladesh has only experienced 7.6 percent growth in GDP per capita. The number of children enrolled in primary school has increased in the Democratic Republic of the Congo, or DRC, from about 49 percent in 1991 to 61 percent in 2010, with almost equal numbers of boys and girls. Overall, it has increased only 25 percent and will absolutely not meet the universal goal by 2015. However, it is important to consider that between 1993 and 1999, completion fell from 52 percent to 32 percent. The subsequent increase since the adoption of the MDGs is approximately 92 percent, meaning nations have been able to fill schools to pre-Rwandan Genocide—which sparked instability in the DRC—and First Congo War levels, and then some. The DRC has made these gains despite persistent civil conflict, which is often referred to as “development in reverse.” Resources are extremely scarce in the country, and it is often ranked as one of the poorest in the world. However, its government recently increased the proportion of the national budget allocated to education from 6.5 percent to 13.8 percent—a largely unheard-of phenomenon in any country, let alone one where the gross national income, or GNI, per capita is $400. One of the poorest nations in the world with one of the fastest-growing populations, Niger has been a leader in reducing child mortality. The country has reduced its child mortality rate by an astounding 67 percent, or about 218 lives, but it is still not considered an MDG success. In absolute terms, its rate of mortality under age 5 is still very high at 113 per 1,000 births, but Niger has achieved the highest absolute reduction of any country. The average reduction in child deaths for sub-Saharan Africa is 22 percent, which Niger exceeds nearly threefold. This is astounding, considering that Niger is a nation of 17.8 million people with a population growth rate of 3.5 percent—the third-highest rate, according to the World Bank—a poverty rate of 43 percent, and GNI per capita of $410 in 2013. El Salvador also reduced its child mortality rate by 67 percent, or about 45 lives per 1,000 births, but did meet the child mortality target. However, with a very low population growth rate of 0.6 percent in 2011 and GNI per capita of $3,720 in 2013, the challenges of reducing child mortality under the MDGs are much different in El Salvador than in Niger. Mauritania has decreased its maternal mortality rate by 51 percent, from 1,200 out of every 100,000 live births in 1990 to 590 live births in 2010. In absolute terms, this change equals 610 lives saved per every 100,000 live births. Only two other countries, Lao PDR and Bhutan, have greater reduction rates in absolute numbers, but both officially pass the three-quarters threshold. Mauritania will not pass this threshold by 2015. Much like Niger, Mauritania ranks as one of the poorest countries in the world and has undergone a number of military coups since 1978; the most recent occurred in 2008. But Belarus, which reduced its maternal mortality rate by 89 percent between 1990 and 2010, achieved the target by saving only 33 lives per every 100,000 live births—much less than the number saved in Mauritania. Again, this is an important accomplishment, but it is an example of how easily percentages can eclipse absolute realities on the ground. Pulling back from these notable victories and continuing challenges, the global community must now look toward the next 15 years with lessons learned and should feel a great sense of accomplishment in the number of lives saved and improved—even if targets and goals are not fully met in 500 days’ time. It is, and will always be, a challenge to apply a uniform set of targets and goals to all nations, but with continued, focused efforts, we may see a world without poverty by 2030. Annie Malknecht is a Research Associate with the Sustainable Security and Peacebuilding Initiative at the Center for American Progress. * Note: Unless otherwise indicated, data is based on author’s calculations using the World Bank “Trends and projections of each MDG indicator for each country,” 1990-2010.